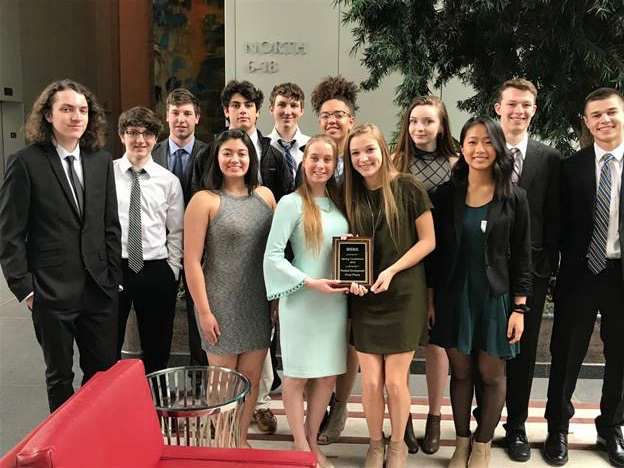 Reading, MA -– Students from the Reading Cooperative Bank’s Retail Banking Course at RMHS participated in the Massachusetts School Bank Association’s annual competition held at the Federal Reserve of Boston on Friday, April 6th. Students were broken up into teams and participated in the following competitions: Banking Bowl, Marketing, and Product Development. The Product Development team placed first for their development of Financial City, a financial planning simulation game that takes a person from college all the way to paying for retirement. The competition had over 300 students participate from 31 schools within Massachusetts that have banking programs like the one at RMHS. The partnership between Reading Public Schools and Reading Cooperative Bank is celebrating its 10th year together this year. Congratulations to the product development team and all the Reading students who participated. For more information, please contact Mike Foley, Reading Memorial High School Branch Manager, at mfoley@readingcoop.com or 781-670-1552.